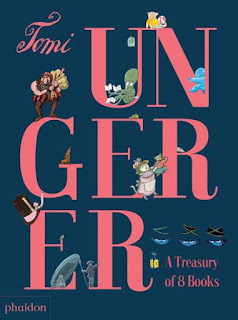 Tomi Ungerer's timeless picture books come together in one beautifully-constructed boxset, making it a perfect gift for a newborn or young child to keep forever. Printed on uncoated paper, which perfectly carries his superb colour palette, readers are treated to an introduction from Tomi, where he speaks about his journey into illustration and children's books. As with many creators, he says that kids' books allow him to return to his childhood, and--even at the age of 84--he creates them for the child who still lives within. Tomi has long created books with a focus on diversity--long before it was a buzzword let alone a hashtag. His clever, fable-like stories are illustrated with varying styles, including whimsical characters, strong, quirky shapes and block colour--the types of pictures that imprint themselves so quickly on the minds of the young. I particularly love the illustration style for Emile, which is reminiscent of the two-tone line drawings used in storybooks of the '50s and '60s. The beautiful pink cover, with embossed titles, will have you running your hand over and cooing out loud. And at the back of the book is a Behind the Scenes interview with Phaidon editor, Maya Gartner, and a biography, making this book for adults as much as kids. If you haven't yet had the opportunity to read Tomi's work, please treat yourself. This gorgeous creation is wonderful for children's book collectors.